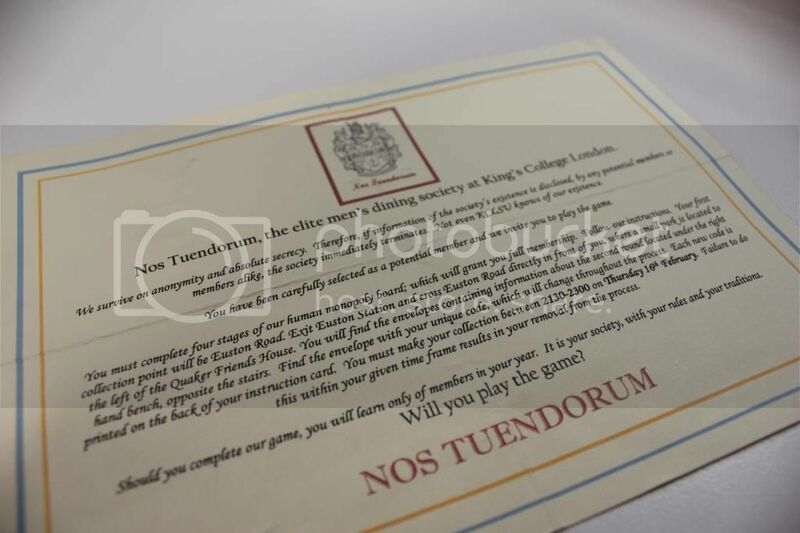 Nos Tuendorum – meaning “We will keep you safe” – is a society for the privileged at King’s College London. Before Roar! exposed the society this month, it prided itself on its secrecy, boasting that ‘Not even KCLSU knows of our existence.’ Roar! can exclusively reveal the contents of the Members Handbook, which provides rules and guidance for new members to the elusive College dining society. A strange invitation is given to potential members, which details how initiation into the society plays out. 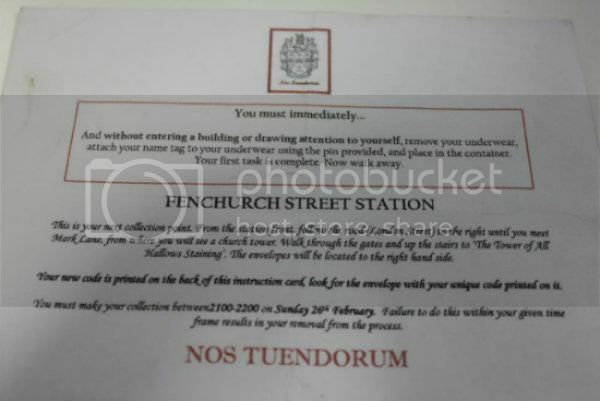 Invitees are told to ‘complete four stages of our human monopoly board’ in order to join. Once a student indicates his intention to join the society, he is sent strict instructions to take part in a curious ritual of removing his underwear and abandoning it in a public place. He must then make his way to a church tower, where he is to collect a unique code. Successful completion ensures full membership of the society. The rules of the Conduct Contract begin with the most obvious one, which is to not disclose the society’s existence to others. Individual members must pay for damages and vandalism, not the society. Perhaps the most stereotypically posh rule is that the men must wear a jacket at all meetings. 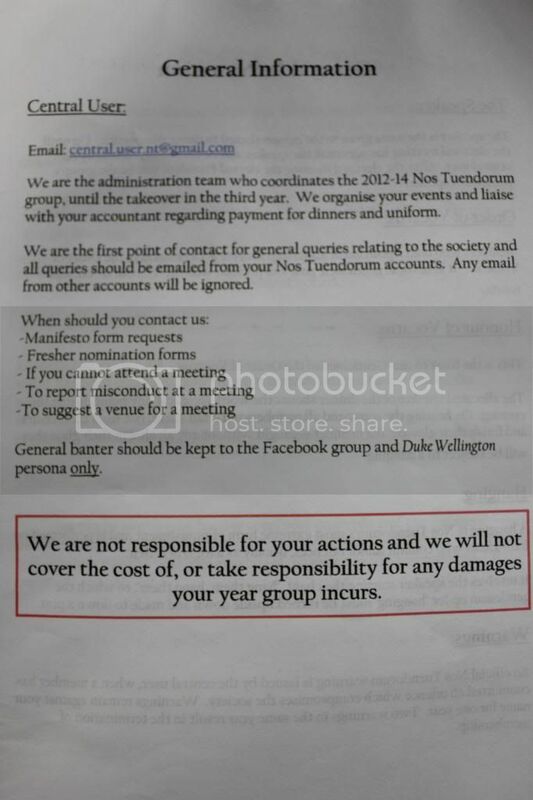 Unlike affiliated KCLSU societies, Nos Tuendorum claims not to have a membership fee. 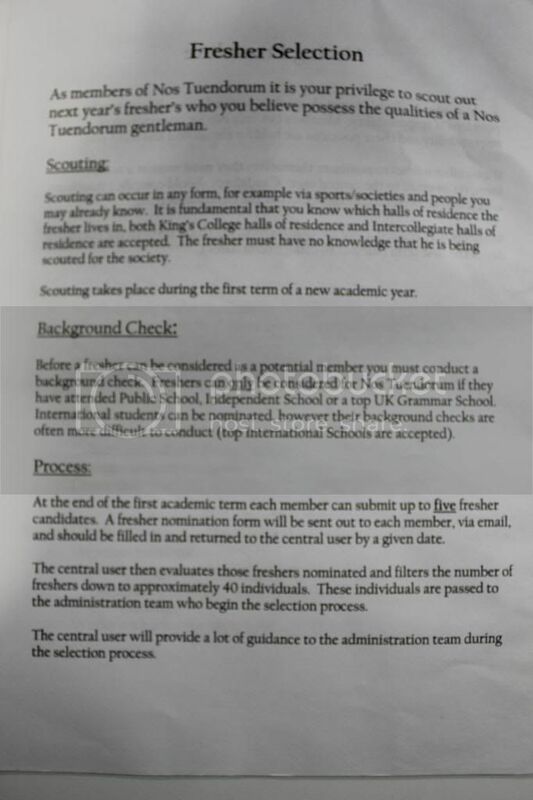 Members are told they must elect an accountant for their year group and he is to open an account at a bank of his choosing. 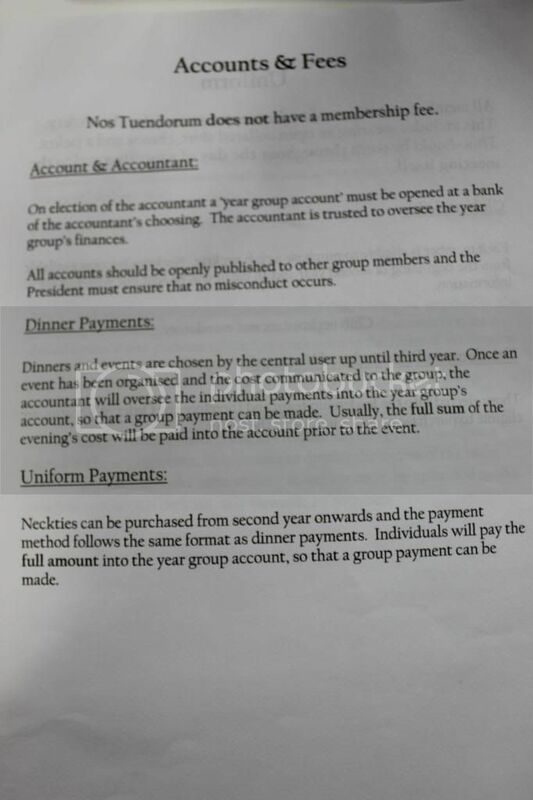 The accountant manages the year group’s finances: money that funds dinners and uniforms. In suitably upper-class fashion, members are told that they must dress in chinos and a jacket on society meeting days. To make members in different years identifiable to one another in public, club neckties are available for purchase from second year onwards. 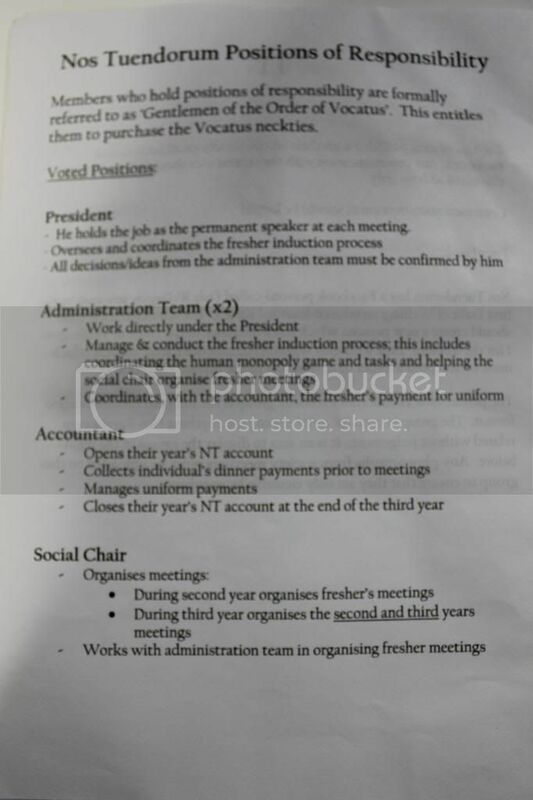 The handbook also lists the committee positions available to members. 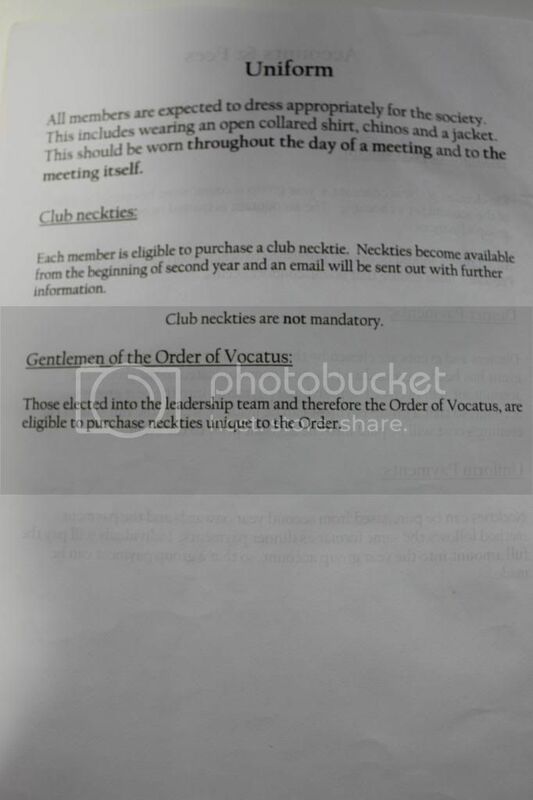 Those who hold official positions are referred to as ‘Gentleman of the Order of Vocatus.’ They are then eligible to purchase a necktie specific to the Order. 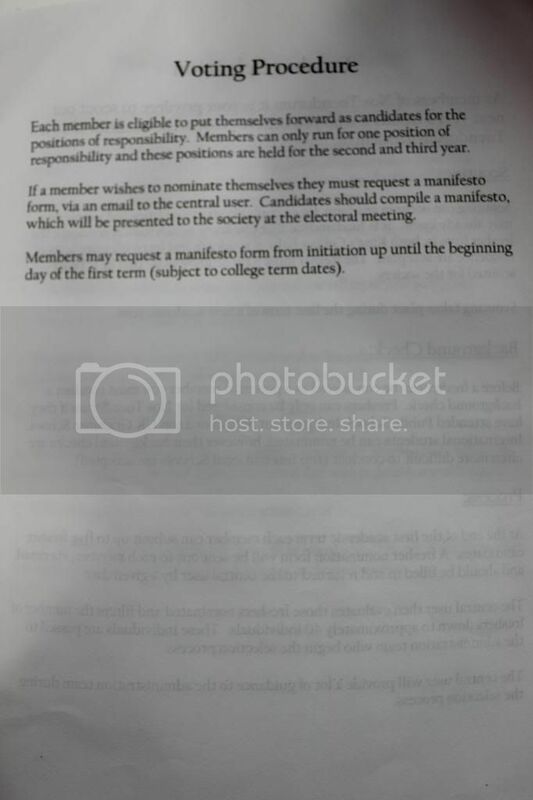 Despite being dubious in its selection policy, the society holds dear the values of democracy, and the Members Handbook provides clear guidelines on nominations and when manifesto forms are available. Members are told that they have the privilege of scouting out freshers who are suitable for admission. Freshers are only eligible to join the society if they have attended public school, independent school or a top UK grammar school. 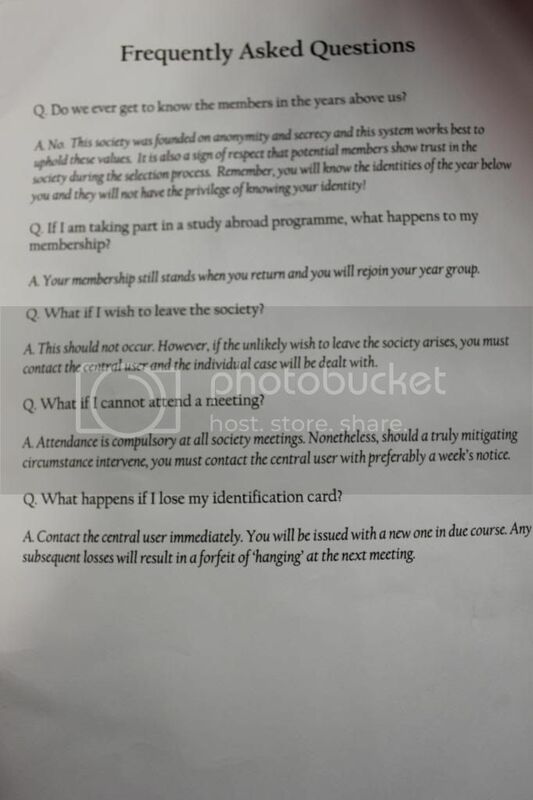 On the FAQs page, members are informed that they are allowed to leave the society if they wish to. The ominous statement – ‘This should not happen’ – perhaps represents the attitude of the committee, that if you are privileged to be in such a society, then it is unlikely that you might want to leave. Since Roar! 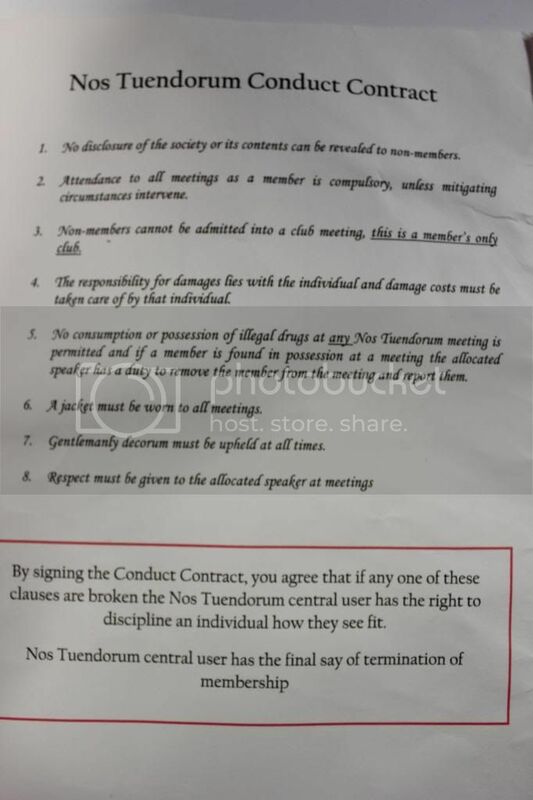 uncovered Nos Tuendorum and its peculiar practices, it has been reported that the society has sent emails to its members, offering legal assistance if they receive any verbal or physical abuse as a result of the exposé. 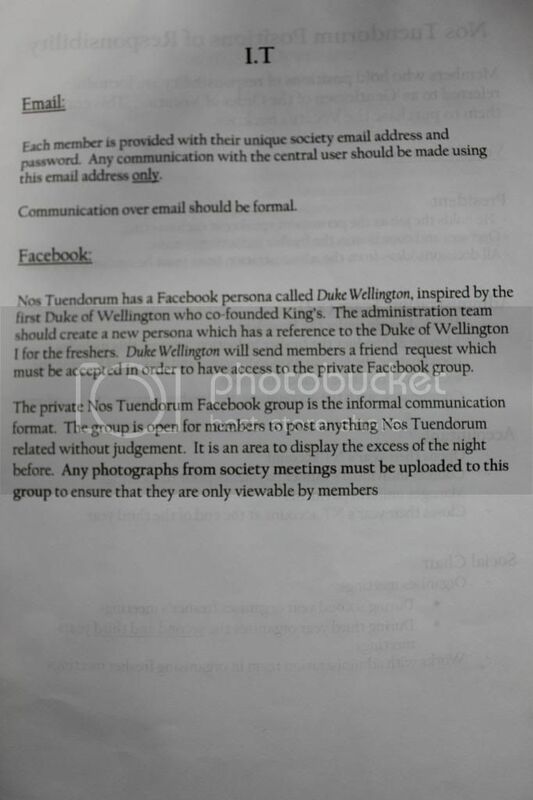 Thus far, three out of twelve students have left the Facebook page for alleged second year members.